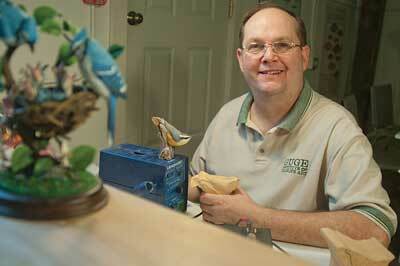 For Bob Guge, carving is an activity immersed in family and in nature. 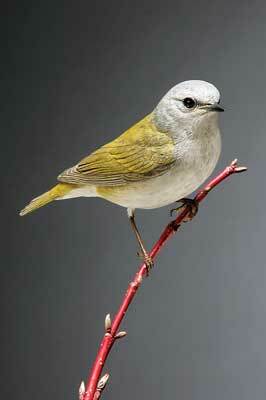 From a young age, Bob would go bird watching and hunting with his father in the Fox River Valley of northern Illinois. Roy Guge was a hunter who began by carving duck decoys, and as his carving became more detailed and sophisticated, he moved on to songbirds and game birds. With this early fascination and education under the influence of his father, Bob's journey into carving birds was perhaps inevitable. In the 1970s, while on holiday with his wife Jody at a National Wildlife Refuge on Chincoteague Island, Virginia, Bob sought out the workshop of renowned decoy carver Delbert 'Cigar' Daisey. He had seen Daisey's decoys in North American Decoy magazine, and knew that he lived in the area. Surprisingly, Bob found out from an information booth in town that there were several different carvers by the name of Daisey in the area; but when he and Jody arrived at the last address, a home on the water with marshland surrounding it, to find a man sitting with his feet up at a big desk, smoking a huge cigar while carving a duck decoy, he knew this was the one he was looking for. "That's what I want to do," he said to his wife. 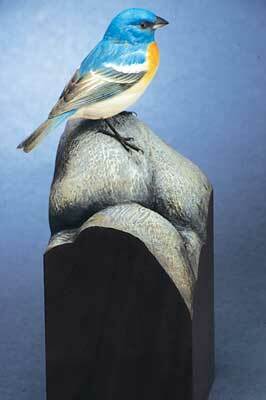 "I still don't smoke cigars, but he sure did influence me on being a bird carver!" Bob tells me, and once he started carving, he never wanted to stop. Bob works in jelutong (Dyera cistulata) imported from Malaysia, and tupelo (Nyssa sylvatica), from the swamps of the southern U.S, as well as acrylics. Admiring one of Bob's perched American kestrels (Falco sparverius) or, his favourite bird to carve, the Henslow's sparrow (Ammodramus henslowii), the brain takes some convincing that the bird is not about to spring into flight or chirp its tune. Inspired by the tradition of decoys by Daisey as well as Miles Hancock - another famous Chincoteague carver - the authenticity of Bob's carvings has an arresting charm. 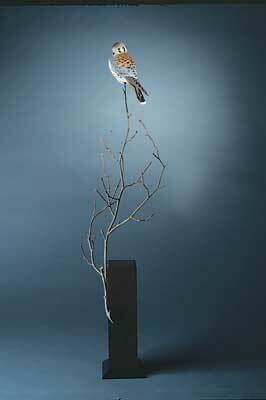 Beyond de facto realism, his eye for the dynamic positioning of birds on a branch give his carvings a further artistic quality, augmented by his reverence for the beauty of these creatures. 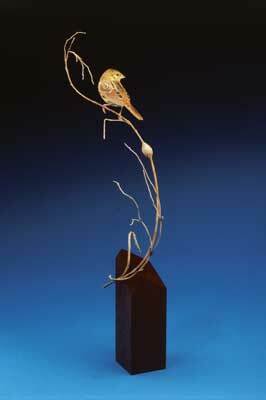 "My favourite pieces are some of the smaller birds I have carved, particularly small sparrows and finches, because of the intricacy in their colour patterns and unique coloration." Bob's main goal is always to capture the essence of a particular species of bird, whether he is carving a detailed bird or a smooth decoy. 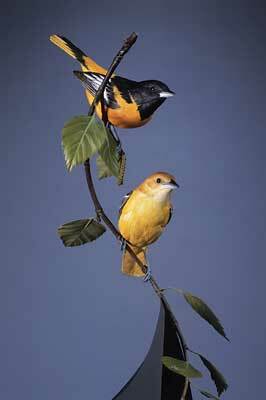 "I think the most important aspect in wildlife art is knowing your subject. If you are familiar enough with your subject, it is possible to reproduce it without reference," he says. Other considerations when starting work on a piece include the bird's habitat, the size of the piece, length of time it will take, cost, and if working to a commission or for a competition, the outlined criteria. "I never know exactly what the next project will be," he says, "because quite often they are commissions, but if not, an inspiration will surface." And inspiration is never far from home; a large population of birds migrate through his hometown area in Gilberts, Illinois, allowing him to study a wide variety of birds. He notes that, as many carvers find as the years advance, his fine motor skills are not as sharp as in the past. But far from seeing that as a reason to stop carving, Bob instead evolves his carving and painting techniques to adjust to these changes. Artistic influences for Bob are not limited to carvers such as Cigar Daisey, Miles Hancock and Harold Haertel - he also cites painters like the Canadian realist wildlife artist Robert Bateman; "His paintings always looked very complete and highly detailed, but also very soft and feather-like. 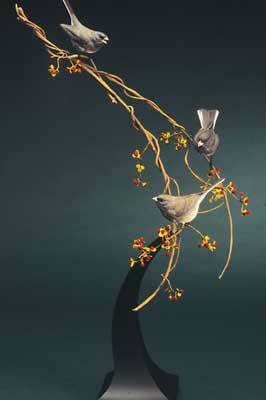 I wanted that effect on my carvings," he explains. "Another bird painter I really admired was Larry McQueen, who would paint perfect birds with simple strokes of the brush. 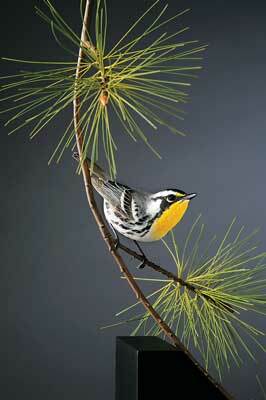 The birds he painted always looked alive," a quality which Bob has pursued himself with great success. Bob's work has earned him worldwide acclaim and many awards, winning the World Championship World Class Miniature Division an incredible five times, and many best of show awards at competitions across the United States. 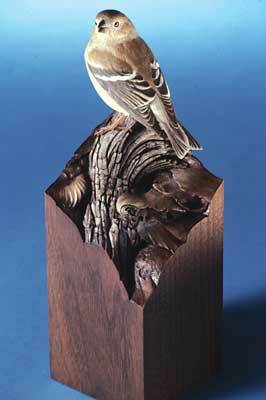 In 2007, Bob received the Ron Ryan Award, which is presented to people who â€œexemplify the ideals of giving oneself, expressing goodwill, and exerting the extra effort needed to promote woodcarving throughout the carving world.â€ His carvings are included in the permanent collection of the North American Wildfowl Art Museum in Salisbury, Maryland; the prestigious Leigh Yawkey Woodson Art Museum in Wausau, Wisconsin and in many private and corporate collections around the world. The Guges' eight children, born between 1975 and 1994, have all joined Bob in the workshop over the years: "All of our children have done art in some way, shape or form. Many times they would work with me in my shop and carve or paint their own things. It has been an absolute privilege to have been a part of this. There were many good times where I was able to bond with my children and pour into them what I had learnt over the years. I believe it is important to pass on the genuine passions and enjoyment of our art to the next generation, that it may not be lost." While most of Bob's children have taken up other art forms such as music, painting and graphic design, Bob's son, Josh, has followed in his father's and grandfather's carving footsteps, though the subjects of his work are not found in the sky, but beneath the water - there will be more on the third generation of carving Guges in the next issue of Woodcarving. Along with pyrographer Sharon Bechtold, the father and son team run the Guge Institute of Wildlife Art, where students from all over the U.S. flock all year round for the Guges' professional instruction. It is pleasing to see a passion passed not only through a family, but shared with the wider public too; look out for students of the Guges in years to come. In November 2012, Bob was diagnosed with stage four brain cancer. He has had the majority of a brain tumour removed, and is undergoing chemotherapy, radiation and a trial drug. His children have set up a website with regular updates on his condition, as well as the facility to send Bob messages of support, and donations to help with the great expense of his treatment. The family are also arranging a benefit locally in Elgin, Illinois on June 29, 2013. Please take the time to visit the website. The Woodcarving team wish Bob the best of health and strength in this difficult time.